In the economic model previously outlined, the role of the banks, both central and private, are a key component that ‘fuel’ the economy in terms of ‘loans borrowed’ and ‘interest paid’. However, while today, the idea of loans and interest are generally accepted as a necessary requirement of any economic system, this was not always the case, when equated to the term ‘usury’. Historically, usury was considered to be the practice of lending money with an associated interest rate or possibly more accurately, an excessive interest rate. However, history suggests that usury has been practiced in various parts of the world for at least 4000 years, while being the subject of much criticism on moral, ethical, religious and legal grounds. The arguments raised against usury have related to work ethics, social justice, economic instability, ecological destruction and inter-generational equity. While some of these arguments might now be perceived as historical, many still contend that there are many negative effects on society when considered in terms of the present-day interest-based global economy. While there are many threads associated with the history of usury, the following discussion will mainly follow the path through the rise and fall of the Holy Roman Empire and the European Renaissance into the modern era. However, from a religious perspective, the objection to usury is anchored in the book of Deuteronomy, which the fifth book of the Jewish Torah, but which also provides moral guidance to Christians and Muslims. Deuteronomy 23:19 Thou shalt not lend upon interest to thy brother: interest of money, interest of victuals, interest of anything that is lent upon interest. Of course, it might be suggested that there is quite a lot of scope for interpretation within the definition of ‘thy brother’ and ‘a foreigner’, which then might suggest that all lending with interest is not absolutely forbidden. In the early days of the Roman empire, loans were made with high interest rates to people in the provinces in order that they might pay their taxes, which were used to support its many military campaigns. As such, this might also be seen as another selective criteria being applied to the morality of usury. Initially, as the Christian church began to expand under the protection of the Roman empire, it appears to have had nothing to add on the subject of usury beyond that implied within Deuteronomy. However, in 325 BCE, the Christian council of Nicaea introduced a ban on usury, although it only applied to its own clergy. Later, in 806 BCE, Charlemagne, now the emperor of the Holy Roman Empire, introduced another ban on usury that was extended to the population at large, although there is little historical evidence suggesting that usury was in common practice beyond the city of Byzantium, which already had a state-regulated system of commerce and banking. However, as the Roman empire began to fail, medieval Europe started to fall into what has become known as the Dark Ages, such that most financial matters were conducted within a barter system based on the exchange of goods and services rather monetary coinage. It was not until the 11th century that the general state of the ‘European economy’ began to improve in any significant way. "Payment may properly be demanded by a craftsman, who makes goods or by a merchant who transports goods over a long distance to a place that is in need of them, because both vocations serve a common good. 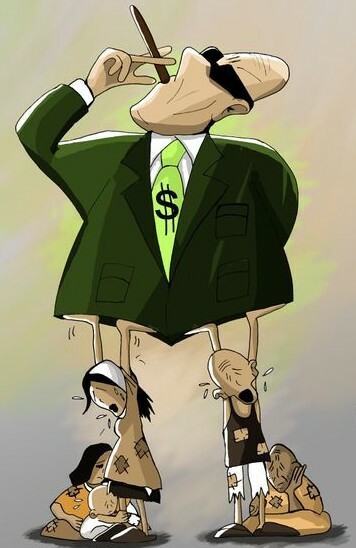 The sin of avarices may hang on them, but indeed it lies unpardonably heavy upon the speculator, those who profit from weakness, who exploit situations for no one's good but their own. " Interest is not profit - it is the avoidance of loss. Within this crafting of words, the usury laws was essentially side-stepped and soon most lenders began to demand interest payments against the ‘possibility of loss’ and, as such, it was not classed as ‘usury’ because the ‘interest’ was not a fee for the use of money. Later, when it became evident that money lenders were simply using the definition of ‘interest’ as a means to side-step the charge of ‘usury’, the Church did not act and the door was left open to further financial ‘developments’. By the 17th century, trade in Europe was mainly conducted in gold and silver coins, and while durable, these coins were difficult to transport in bulk and run the risk of being stolen. As a consequence, many traders started to deposited their coins with local goldsmiths, simply because they own the strongest safes. In return, the goldsmiths started to issue paper receipts, which in-turn were used as a form of ‘paper money’ and traded in preference to gold coins. However, it did not take long for this class of ‘goldsmith’ to noticed that only about 10-20% of their receipts were ever redeemed at any given time. As a consequence, they started to ‘lend’ against the gold reserves they held on behalf of others, but several times over the actual value held, as they only required the 10-20% figure to meet the normal demand for gold to be redeemed. Note: Today, we might quickly realise that the goldsmith was effectively creating ‘paper money’ that exceeded the actual gold reserve by a factor of 5. If we assume an interest rate of 20%, it would have produced a 100% profit every year on gold reserves that did not exist and which the goldsmith was not legally allowed to lend. So while the goldsmiths had to be careful to cover any immediate demands for gold to be returned, they were becoming increasingly wealthy without actually producing anything of value themselves. However, although only the principal sum was lent and entered the money supply, more money was paid back, i.e. principal plus interest, such that it would eventually exceed the original wealth in the local community, i.e. it triggered an inflationary spiral. As consequence, more and more people were forced to take out loans of this ‘new paper money’ to cover any shortfall being caused by the wealth being siphoned into the vaults of the goldsmiths-turned-bankers. But does this historical perspective have any relevance today? Where did all this new money come from? Apparently, the US government had not increased its supply money and no gold was added to the US money supply, since the US had abandoned the gold standard in 1933. As such, this new money was effectively ‘created’ by private banks as ‘bank credit’ and linked to the loans issued. However, as the town-people in the goldsmith-banker model found out to their cost, the problem with inflating the money supply in this way is that it inflates prices, i.e. the cost of everything goes up. For more money entering the any economy has the effect of driving up prices, such that $1 buys less, which essentially robs people by reducing the value of their money. Strangely, this form of inflation is often blamed on the government, for it is frequently assumed that governments simply print more fiat money in order to maintain public services without having to resort to the politically unpopular decision to raise tax rates. However, in the US, the government is only responsible for issuing coins, not larger valued paper money. Even so, in countries where the central bank is nationalised institution, so that paper money may be issued by the government, it is known that they only sources a small percentage of the money supply. For example, in the UK, where its central bank was nationalised after World War II, private banks continue to create 97% of the money supply as loans. However, price inflation is only one problems associated with this system of private bank money creation. Again, as the town-people of the goldsmith-banker model found out to their cost, the private banks only create the principal sum, not the interest required to pay back their loans. Given that virtually all the money supply (97%) is created by the private banks themselves, new money must continually be borrowed into existence in order to pay the interest owed to the bankers. So, in the case of the US economy, $1 lent at 5% interest becomes $2 in 14 years, which means the money supply has to double every 14 years, just to cover the interest owed on the money existing at the beginning of this 14 year cycle. In the US, the Federal Reserve's own figures confirm that the money supply has doubled every 14 years since 1959. Note: Based on these actual figures, it means that private banks effectively siphon off as much money in interest as there was in the entire economy 14 years earlier. Of course, what is possibly more astounding is that this profit has been extracted, as interests on loans, based on paper money they created out of thin air. This business model, or scam to many, now affects the entire global economy and has become the underlying cause of poverty, economic slavery and under-funded governments, which the majority appear not to understand and therefore powerless to change. Are there any other long-term issues that need to be considered? In a wider context, this series of discussions related to the global economy considers whether there are any other limits to economic growth based on the seemingly obvious fact that we all lived on a planet with finite resources. Ultimately, it would seem that the ‘goldsmith-banker’ model can only drive the inflationary spiral into the future and seed the apparently endless demand for economic growth, without which the model will collapse. If so, it may be further evidence that the ‘limit to growth’ model to be discussed is unavoidable. However, before addressing such issues, we possibly need to consider the role of ‘banks, money and loans’ in a little more detail. "Usury once in control will wreck the nation." The law against usury is for the protection of creditors as well as debtors; for if there were no such check, people would be apt, from the temptation of great interest, to lend to desperate persons, by whom they would lose their money. Accordingly there are instances of ladies being ruined, by having injudiciously sunk their fortunes for high annuities, which, after a few years, ceased to be paid, in consequence of the ruined circumstances of the borrower. To accept usury for the loan of money is in itself unjust; because this is selling what does not exist, and must obviously give rise to inequality, which is contrary to justice. For the better understanding of this point it should be noted that there are some things whose use lies in their consumption: as, for example, wine is consumed when it is used as drink, and wheat is consumed when it is used for food. In such cases the use of the thing and the thing itself cannot be separately taken into account, so that whenever the use of the thing is granted to some one the thing itself is given at the same time. For this reason ownership is transferred by a loan in such cases. If a man were to sell separately both the wine and the use of the wine he would be selling the same thing twice over; that is he would be selling what does not exist: and he would clearly be sinning against justice. For the same reason he commits an injustice who requires two things in return for the loan of wine or wheat, namely the return of an equal quantity of the thing itself and the price of its use. This is what is called usury. There are other things whose use does not lie in the consumption of the thing itself; as for instance the use of a house, which lies in the living in it and not in its destruction or consumption. In such cases both the use and the thing itself can be separately granted; as when, for instance, some one passes the ownership of a house to another, but reserves to himself the right to live there for a certain time; or on the other hand when some one grants the use of a house to another, reserving to himself its ownership. For this reason it is permissible for a man to accept a price, i.e. rent, for the use of a house, and in addition to sell the freehold of the house itself, as is clear in the sale and leasing of houses. Now money, according to the philosopher Aristotle is devised mainly to facilitate exchange; and therefore the proper and principal use of money lies in its consumption or expenditure in the business of exchange. For this reason, therefore, it is wrong to accept a price, or money, i.e. interest, for the use of a sum of money which is lent.